When people talk about the great guitarists of the 1960’s it usually begins with the holy trinity of rock; Hendrix, Clapton and Beck as something like Father, Son and Holy…well…you get the idea. This may be a bit of a stretch, but it works, at least as a metaphor of sorts. There were others, Mike Bloomfield, being one of the best examples, especially because he got there first, before the other three were really known. Early on, he was every bit their equal in terms of talent and influence, although as time went on he consciously began to retreat from the whole guitar-star thing in an attempt to find something more substantial. Others followed, Duane and Dickie, Jerry Garcia, who was another early contender, Johnny Winter, who began recording before any of them, but, was the last to hit it big. Peter Green and Mick Taylor were two others—and then, there was Rory Gallagher. Rory wasn't an American or an Englishman, he was an Irishman from Cork, near war torn Belfast at the peak of its violence. Like just about every part of Britain’s vast empire, if you were a musician of a certain age and played the guitar, you played the blues. It was a world where Clapton was god and Black American musicians wrote the holy narrative that formed the basis for it all. At times, it’s been suggested that Rory was just another Clapton imitator. From the very beginning, however, he was different. Unlike Clapton, who seldom sang, at least in the initial stages of his career, Rory was front and center; singer, guitar-slinging-showman and songwriter. 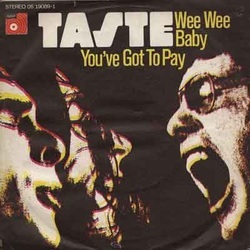 It was his band and conception that made “Taste” the late sixties heir apparent to Cream’s abdicated, power trio throne. After a couple of records (all of which are well worth seeking out) Taste broke up and Rory went out on his own. With a solo album or two under his belt and endless touring he finally hit it big, developing a significant following in both America and Europe. With the release of “Live in Europe” his recorded output became nearly as prolific as his touring schedule and his reputation grew with it. Gallagher was widely regarded as one the finest guitarists of his generation—and rightly so. His blistering Stratocaster work predated Clapton’s use of the instrument and he managed to sidestep the usual Hendrix comparisons by developing his own distinctive voice as an alternative. Where He was deeply steeped in the blues tradition he seldom played verbatim versions of American blues, unlike just about every other guitarist of the period. Instead, he used traditional songs as a jumping off point for his own re-imagining of what had become overused material. Watching his interviews you get the sense that he was naturally shy. Watching him perform is another matter altogether. Whatever shyness he displayed when talking to the press wasn’t evident when he took the stage. Unlike Hendrix, he wasn’t given to showmanship for its own sake, his was a barely contained exuberance, with a relentless, flying-by-the-seat-of-your-pants-energy. He also grew as a prolific songwriter. One whose lyrics were more than the usual fodder to fill space between hot solos and a groovy guitar riff. Eventually, the touring, the pills and alcohol that fuel late nights, long concerts and endless travel, took its toll. As Rory’s health and emotional state declined, depression, the final payback for the long road and the rock & roll life brought it all to an end. He died on June 14, 1995 due to liver failure, about six months after his final concert. Rory Gallagher was, by any reasonable measure, one of the greatest guitarist in an era of great players. He was as good as the best and a helluva a lot better than the majority of his peers. He helped to define rock music as a distinct animal from rock & roll, moving the music from its dance based roots to an improvisational art form; part blues, part modern jazz, with roots that ran river-deep through it all. Here he is in all his youthful glory, both with Taste and as a solo artist. On video and record Rory remains alive and well—on fire for all to see—and for that, we are grateful.